With the new Taken King DLC, Bungie have decided to leave some Year 1 exotic weapons and armour behind, preventing them from reaching the same levels as newer exotics (Year 2) and a few handpicked exclusions. When I say left behind I'm referring to the fact that the exotics remain in the Year 1 state. They are still in the game and usable, but will never reach the same attack or defence ratings as other exotic items. Some might consider this the list of Old Exotics vs New Exotics, or Year 1 vs Year 2...which ever way you look at it, there are many weapons and armour pieces which are now redundant in the game. To help make my life easier (and yours), I decided to create this list as a guide to which weapons and armour are keepers and which can be safely discarded come TTK. 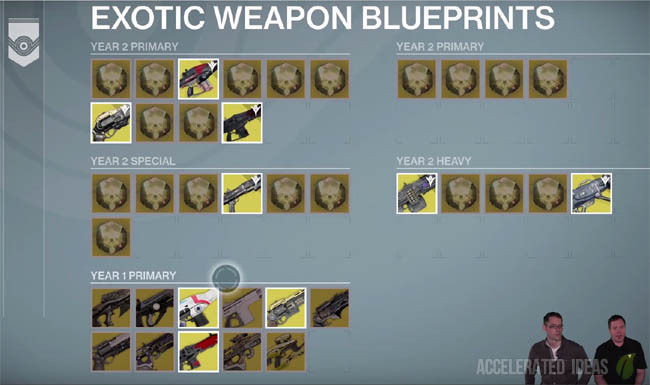 Using the new exotic blueprint system you can immediately upgrade a confirmed Year 2 exotic from its lower Year 1 stats to the higher Year 2 level. You'll see this confirmed list further down the page. 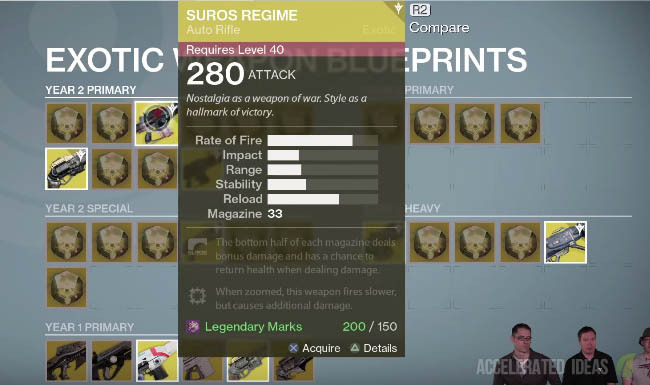 As an example, if you have Suros Regime (a confirmed weapon) you can immediately create the Year 2 version in the Taken King - it'll just cost you a heap of Legendary Marks (see image above). Upgrading and even recreating exotic armour is also easy and you shouldn't be afraid to discard an exotic because you can easily recreate it without relying on Xur. As you'll see from the list below, Bungie have chosen to leave behind a large number of great exotic weapons including the overpowered Gjallarhorn, Ice Breaker and Thorn. These weapons were a godsend for nightfall, raids and high level PvP matches - they will be sorely missed! As a regular solo player, having these weapons removed is going to make soloing any Nightfall or high level content very difficult in The Taken King. I can see the sense in removing them because they were overused but fingers crossed the newer exotics such as Sleeper Simulant or No Time to Explain are exceptionally good as well. Ok enough talking, here's the list of upgradable exotics. Please note, this list may change as Bungie balances the game.